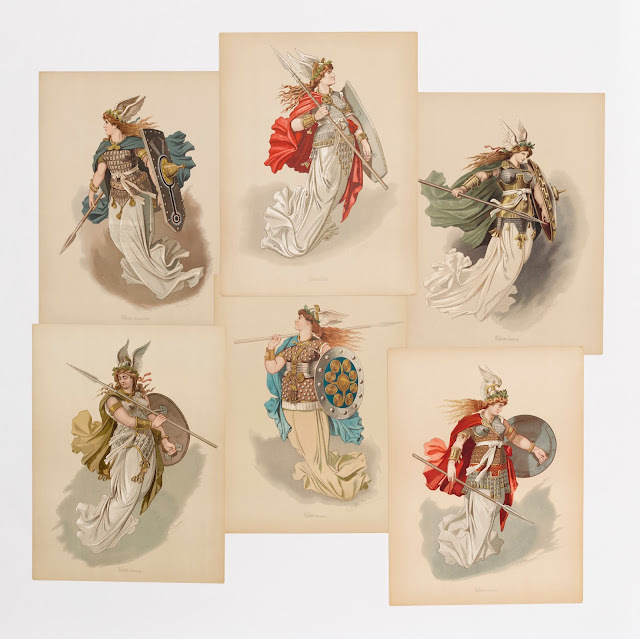 Carl Emil Doepler (1824–1905), Costume design for Brünnhilde, Der Ring des Nibelungen: Figurinen, Berlin: Berliner Kunstdruck- und Verlags-Anstalt, 1889, Chromolithograph. Gift of Hester Diamond, 2012. The Morgan Library & Museum. It's practically unfathomable today to understand the popular impact of Richard Wagner's Ring Cycle when it premiered in 1876. It is more rightly compared to the latest Star Wars or, more analagously, Lord of the Rings premiere than any modern opera. Or it's possibly comparable to the current publicity tsunami of Lin Manuel Miranda's Hamilton on Broadway. But none of those merited a series of newspaper front-pages dedicated to reprinting segments of the score or script, as the Ring Cycle did in the New York Herald. We're talking about major real estate, not simply one of 10 articles or photos. Of course the 26-year build-up to the premiere, in Bayreuth, Germany, is the stuff of legend itself. This story is told at the Morgan Library's Wagner's Ring: Forging an Epic exhibition, on view through April 17. The trove of artifacts ranges from many letters and scores hand-penned by Wagner; a royal decree; costume designs; books; the aforementioned newspapers; an ivory, bejeweled conductor's baton; and a series of etchings showing Joseph Hoffman's scenic designs. Of particular note are a copy of Wagner's own score with his notes and remarks, and compositional drafts that would form the basis of the final opus. Lilli Lehmann as Woglinde in Das Rheingold. 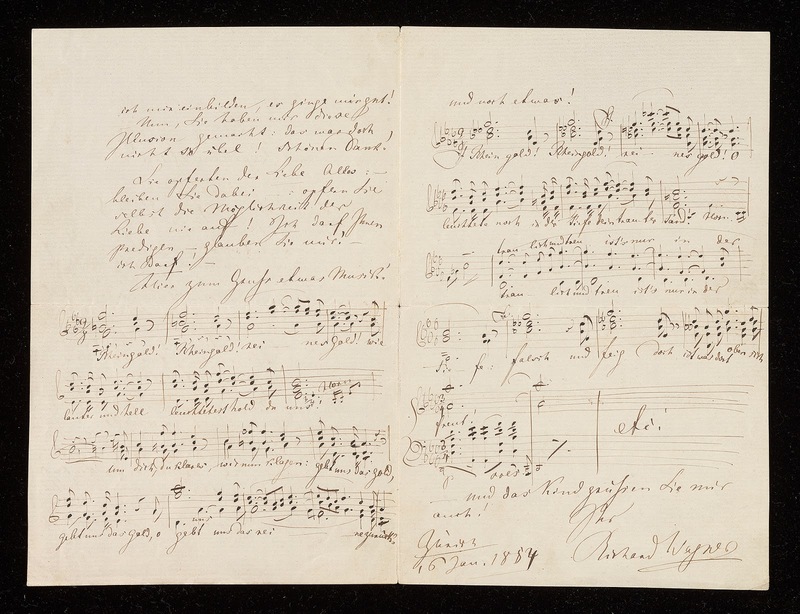 As it goes for artists, Wagner needed money to fund his vision. King Ludwig II of Bavaria, a young monarch with a passion for Wagner's music, stepped in when the wealthy composer Franz Liszt declined. Lest we think it was an easy ride, Wagner—who, fleeing creditors, had to be tracked down by the king's agent—signed a contract promising a finished score within three years; it would then belong to the king, and in return Wagner's debts were erased and he was given a salary and housing. Sounds pretty sweet, right? But Wagner decided he wanted it to premiere in Bayreuth rather than in Munich, as agreed upon by contract. This entailed designing a theater (Festspielhaus) to his specifications and raising the money for construction. In addition to the royal stipend, this meant leaning on private societies founded to support Wagner's work, a kind of precursor to Kickstarter. The exhibition shows what an institution like the Morgan does best. It draws on its own collection, but many objects are on loan from the Richard Wagner Museum in Bayreuth. It's interesting to see what all the fuss was, and continues to be, about.